It was accepted by the vast majority of Melkite Bishops and by many Eastern Catholics. A bold ecumenical proposal, it was also controversial in both the Catholic and Orthodox Churches. For those interested, more detail on the history of the Zoghby Initiative can be read here. In 1997, I read a news article that 3 Cardinals, at the urging of Pope John Paul II, had written the Melkite Patriarch with commentary on the Zoghby Initiative. 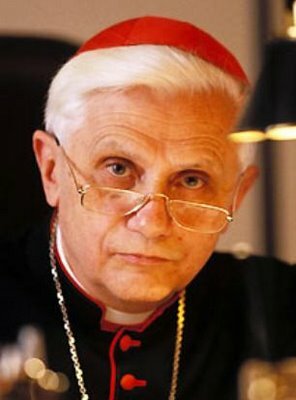 The Cardinals were: 1) Joseph Cardinal Ratzinger (now Pope Benedict XVI) of the Congregation for the Doctrine of the Faith, 2) Achille Cardinal Silvestrini of the Congregation for the Eastern Churches, and 3) Edward Cardinal Cassidy of the Pontifical Council for Christian Unity. 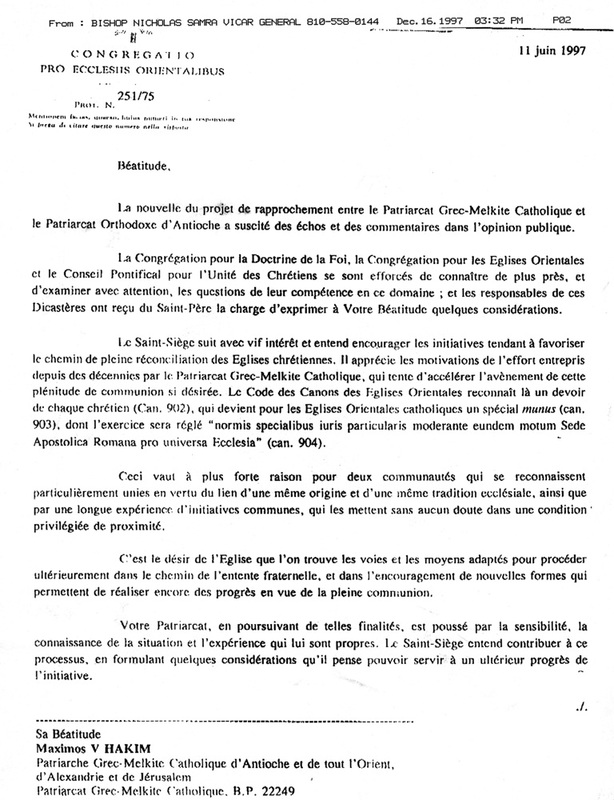 I contacted Bishop Nicholas Samra of the Melkite Eparchy in the USA and he graciously faxed a copy of the original French letter. This letter from the Roman congregations on the Zoghby Initiative has previously been translated into English a couple of times but I was impressed with this fresh new translation which I received today. I thought readers here might be interested in seeing it along with the original French text. I thus present it here without commentary. What is the status of the Zoghby Initiative since this letter was written? The current Melkite Patriarch has re-affirmed his Church’s commitment to the vision of the Zoghby Initiative. Many Eastern Catholics still subscribe to the proposal but some, citing Pope John Paul’s Apostolic Letter Ad Tuendam Fidem, have asked if it is “dead.” Orthodox reaction has been cautious, questioning whether unity of faith has actually been achieved between the Melkite Church and Orthodoxy, which is seen as a pre-requisite for inter-communion. The new translation from the French original is below. It can also be viewed in a PDF along with supporting documents here. Word of the project for a rapprochement between the Greek-Melkite Catholic Patriarchate and the Orthodox Patriarchate of Antioch has been widely noted and given rise to much public discussion. The Congregation for the Doctrine of the Faith, the Congregation for the Eastern Churches, and the Pontifical Council for Christian Unity have striven to familiarize themselves and examine with care those aspects that lie within their respective competence; the heads of these Dicasteries have further been charged by the Holy Father to share some observations with Your Beatitude. The Holy See follows with great interest and wishes to encourage initiatives that could ease the way to a complete reconciliation of the Christian Churches. It recognizes the imperatives behind the decades-long effort of the Greek-Melkite Catholic Patriarchate aimed at promoting the realization of this sought-for fullness of communion. The Code of Canon Law for the Eastern Churches recognizes in this a duty for every Christian (Can. 902), that becomes for the Eastern Catholic Churches a special munus (Can. 903), to be pursued according to “normis specialibus iuris particularis moderante eundem motum Sede Apostolica Romana pro universa Ecclesia” [“by the special norms of particular law, the Apostolic Roman See directing the movement for the entire Church”] (Can. 904). This is all the more valid for two communities that see themselves as especially tied to one another from their common origin and shared ecclesial tradition, as well as through a long experience of joint initiatives, placing them without a doubt in a privileged state of closeness. It is the wish of the Church that appropriate ways and means be found to proceed in future along the path of fraternal agreement, and through the assistance of new forms that would allow the further realization of progress towards full communion. Your Patriarchate, in pursuing such goals, is spurred by the sensitivity, the situational understanding, and the experience that are uniquely its own. The Holy See intends to aid this process through the formulation of a few observations that it believes could contribute to a future furthering of the initiative. The responsible Dicasteries broadly welcome joint pastoral initiatives between Catholics and Orthodox, undertaken as proposed in the Directory for the Application of the Principles and Norms on Ecumenism, most particularly in the fields of Christian formation, education, common charitable endeavours, and shared prayer when this is possible. Specifically with respect to theological heritage, one must proceed with patience and prudence, and without precipitation, in order to assist both parties in following a shared path. A first dimension of this sharing concerns the language and categories used in the dialogue: one has to apply the greatest care that the common use of a word, or of a concept, not lend itself to differing points of view or interpretations of a historical or doctrinal nature, nor to any form of over simplification. 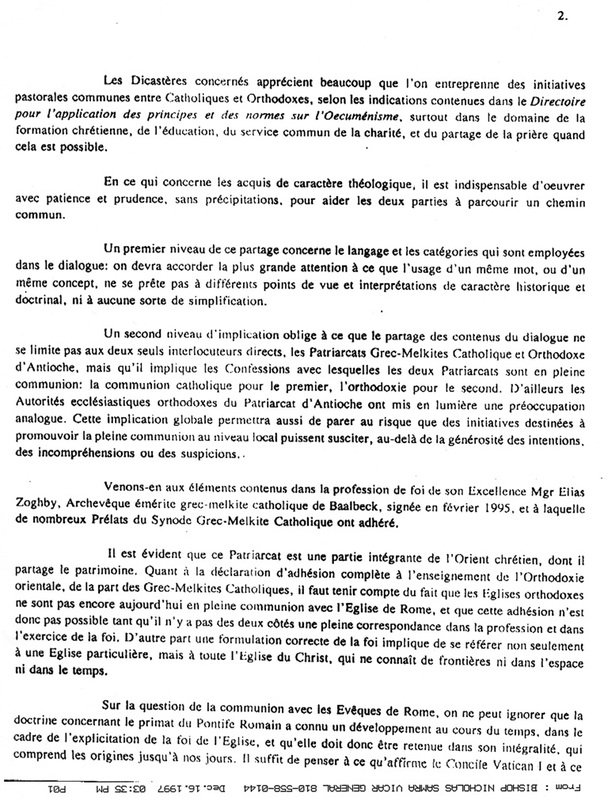 A second dimension necessitates that the sharing of the contents of the dialogue not be limited solely to the two direct interlocutors, the Greek-Melkite Catholic and Orthodox Antiochian Patriarchates, but that it should also implicate the wider Confessions with which the two Patriarchates are in full communion: the Catholic Communion for the former, and the Orthodox Communion for the latter. The Orthodox ecclesiastical authorities in the Patriarchate of Antioch have, in any case, highlighted analogous concerns. This more comprehensive participation would also help ensure that initiatives aimed at promoting full communion at the local level do not give rise to misunderstandings or suspicions, even with the best of intentions. 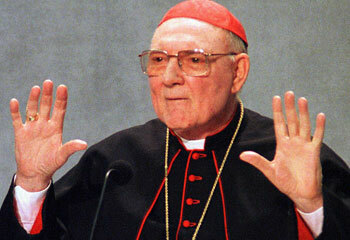 Let us now turn to the terms of the profession of faith of his Excellence Mgr. 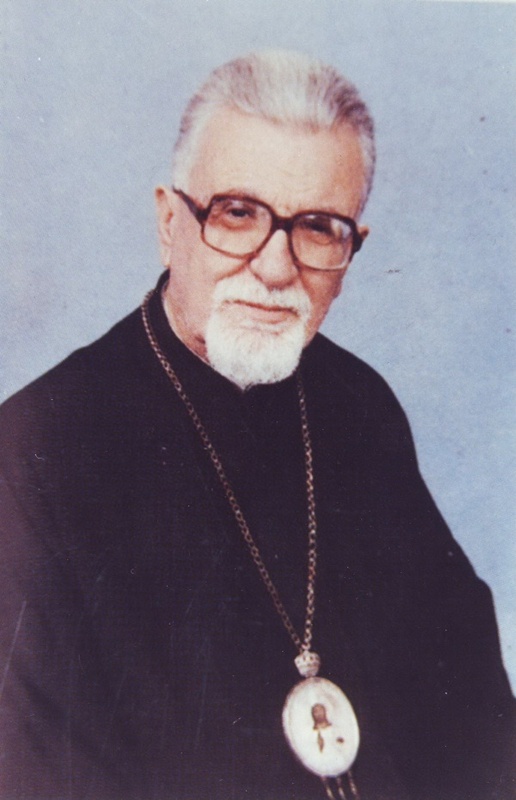 Elias Zoghby, Greek-Melkite Catholic Archbishop emeritus of Baalbeck, signed in February 1995, and to which many prelates of the Greek-Melkite Catholic Synod have subscribed. It is evident that this Patriarchate forms an integral part of the Christian East whose patrimony it shares. 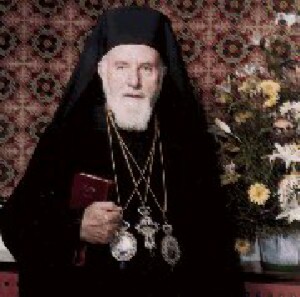 With respect to the declaration on the part of Greek-Melkite Catholics of complete adherence to the teachings of Eastern Orthodoxy, one must keep in mind the fact that the Orthodox Churches are today not yet in full communion with the Church of Rome, and that this adherence is thus not possible so long as there is not from both sides an identity of professed and practiced faith. Furthermore, a correct formulation of the faith requires reference not only to a particular Church, but to the whole of the Church of Christ that is limited in neither space nor time. With respect to communion with the Bishops of Rome, one must not forget that doctrine relating to the primacy of the Roman Pontiff has been the subject of some development within the elaboration of the Church’s faith through the ages, and that it must thus be upheld in its entirety from its origins all the way to the present day. One need only reflect on what the First Vatican Council affirms and on what has been declared at the Second Vatican Council, particularly in NN. 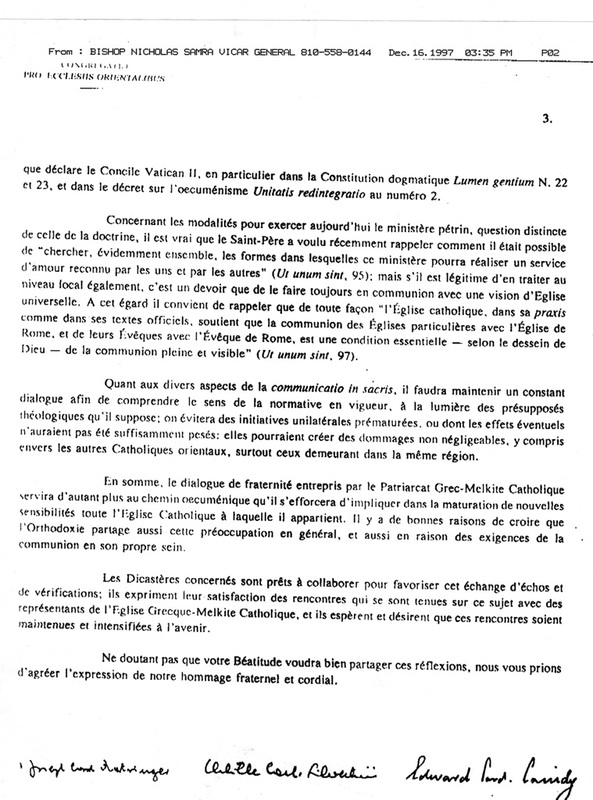 22 and 23 of the Dogmatic Constitution Lumen Gentium and in N. 2 of the Decree on Ecumenism Unitatis Redintegratio. As to the ways in which the Petrine ministry could be exercised today, an issue distinct from that of doctrine, it is true that the Holy Father has recently reminded us all how it is possible to “seek—together, of course—the forms in which this ministry may accomplish a service of love recognized by all concerned” (Ut unum sint, 95): but while it is also legitimate to approach the issue at the local level, there is a duty to do so always in communion with a view to the universal Church. In this regard, it would in any case be appropriate to recall that “the Catholic Church, both in her praxis and in her solemn documents, holds that the communion of the particular Churches with the Church of Rome, and of their Bishops with the Bishop of Rome, is—in God’s plan—an essential requisite of full and visible communion” (Ut unum sint, 97). As to the various aspects of communio in sacris, an ongoing dialogue will have to be maintained in order to explore the rationale underlying the respective norms currently in effect, and this in light of the theological assumptions that underlie them; in this way premature unilateral initiatives or eventual outcomes that would not have pondered sufficiently might be avoided: these could lead to significant negative consequences, including with respect to other Eastern Catholics, most especially to those living within the same region. All in all, the fraternal dialogue pursued by the Greek-Melkite Patriarchate will contribute all the more to the path of ecumenism insofar as it strives to include in the development of new sensibilities the whole Catholic Church to which it belongs. There is a good basis for believing that Orthodoxy also shares this concern, and this largely also in consideration of the requirements for communion within its own body. The Dicasteries concerned are ready to offer their collaboration in furthering this exchange of reflections and clarifications; they further express their satisfaction with the meetings held so far on this subject with representatives of the Greek-Melkite Catholic Church, and both hope and wish to see these exchanges maintained and deepened in future. Fully recognizing that Your Beatitude will wish to share these reflections, please accept the expression of our fraternal and cordial regards. Comments turned off. Permission is granted to re-post this article. Please provide a link back to the original article when so doing.